Echo players in white, including Ashley Gregerson, Taylor Tarvin and Kristen McCallum set up their defense against Arlington on Tuesday night. ECHO - The Echo Lady Cougars hosted the Arlington Honkers met in Big Sky 1A-East action on Inauguration Day, Tuesday, Janurary 20, 2009. The game started off slow with Echo closing to within three points several times during the game. The Arlington Honkders took the win 42-35. The game started slow with Arlington leading 13-6 at the end of the first period. Ashley Gregerson hit back to back shots to put the Cougars on the board. Also scoring for the Cougars was Kristin McCallum. The pace of action for the Cougars picked up in the second period as they scored ten points. Cougars scoring in the second included Shilah Hillard hitting two shots and Gregorson scored on two freethrows. Arlington led at halftime 25-16. The Cougar defense held Arlington to just two points for the first four minutes of play in the third period. In fact, Echo outscored Arlington 13 to 7 in the third holding the Honkers scoreless in the final two minutes of the period. Cougars scoring included Lauren Elligsen, Taylor Tarvin, Hillard, McCallum, and Gregerson. Echo closed to three but Arlington still led 32-29 at the end of the period. Arlington came on strong in the fourth outscoring Echo 10 to 6 to stretch their lead to seven. The Honkers won 42-35. 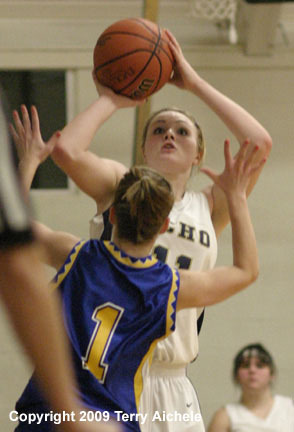 The high scorers for both teams was Echo's Shilah Hillard with 14. Other Echo scorers inclued Ashley Gregerson with 8, Kristin McCallum 6, Taylor Tarvin 3, Reese Tarvin 2, and Lauren Elligsen 2. High scorer for the Honkers was Kayla Davidson with 13 followed by Jessica Mundy with 9 and Ashley Wetherell with 8. Echo players are getting used to changes in play following the knee injury Elizabeth Ferge suffered in the game at Dufur on January 9. The junior guard was at the game with Arlington supporting her team Tuesday night. She kept her colorful crutches nearby. The knee injury has brought her plans for basketball and spring sports to an end as she awaits surgery. 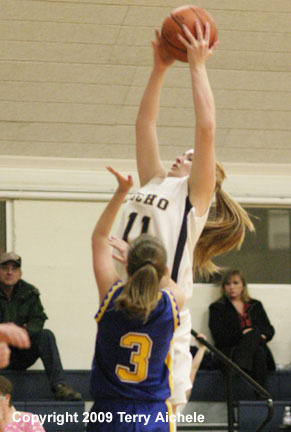 LEFT - Ryanne Tarvin of Echo grabs a rebound and looks for someone to pass to. RIGHT - Cougar Kristen McCallum takes a shot over Jessica Wetherell of Arlington. 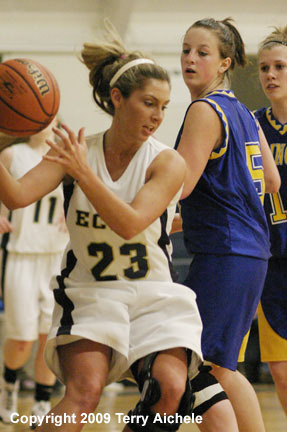 LEFT - Ashley Gregerson of Echo starts to spin towards the basket during the game Tuesday night. 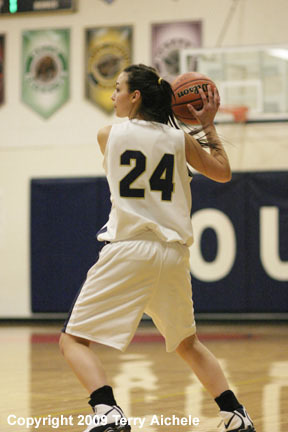 RIGHT - Courgar post Lauren Elligsen looks for someone to pass the ball to. 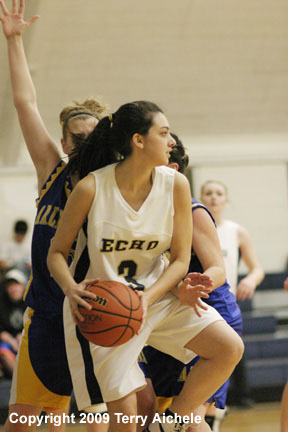 LEFT - Lauren Elligsen of Echo with the ball. 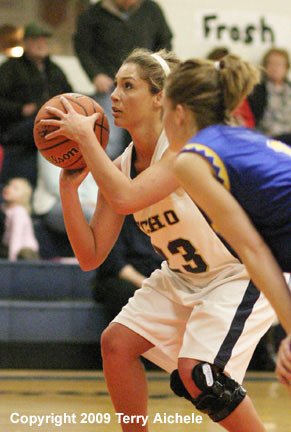 RIGHT - Ashley Gregerson of Echo battles with Jessica Wetherell of Arlington for control of the ball following a rebound. 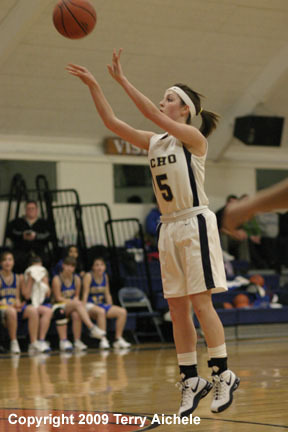 LEFT - Ashley Gregerson of Echo shooting a foul shot. 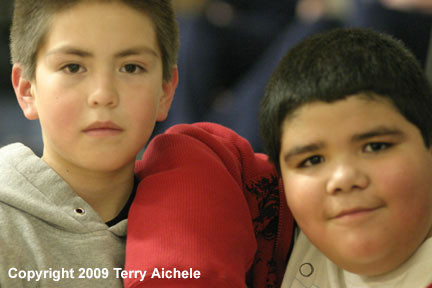 RIGHT - A photo of two Echo fans at halftime. 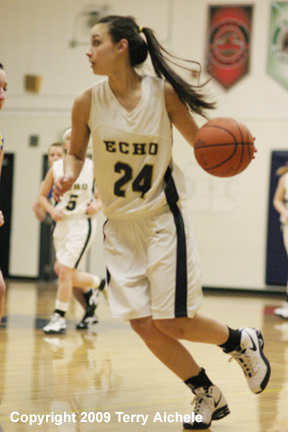 LEFT - Elizabeth Ferge, Echo junior guard, sports a brace on her left leg. 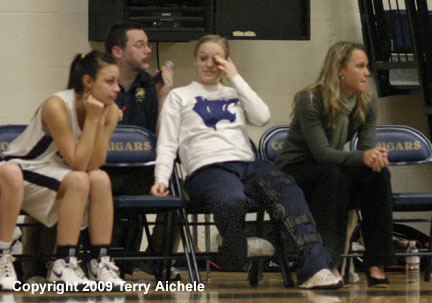 She injured the acl and meniscus in her knee during the January 9 game at Dufur. RIGHT - Kristen McCallum of Echo takes a shot while being guarded by Preston Christensen of Arlington.